Last Year's Genealogy Resolutions - a Big Uh-Oh! Uh-oh. This morning I reviewed my Genealogy New Year's Resolutions from Jan 1, 2010. I didn't do very well! 1. File my genealogy papers. Oh boy. I never did get around to that.... Does it count that I filed all my PEER documents and papers so that I could organize the data to work on my books on this family? It was a pretty big job. 2. Finish books on Peer Family of North America. Another uh-oh. I did finish Volume 1 and it has been selling well! Partial kudos to me? 3. Prove my Shuart line or find supporting evidence of my theory of my Elizabeth Shuart's parents. I did find strong supporting evidence of my relationship theory! Phew! 5. Enter old genealogy data that I've filed away over the years. Nope - the only old genealogy data I entered was for my PEER books. Mind you that was a *huge* job! It took me over a month to complete it. Maybe that counts a wee bit? So - those were my five genealogy goals from January 2010. I can't believe an entire year has gone by since then! And what have I been doing? It's not like I sit around all day and daydream. I think the problem is that I'm not focused enough. I start a project full of excitement. Boredom quickly sets in and I move to another project! So the first one gets put on hold - temporarily of course.... or at least that is my intention at the time. Out of my five rather lofty resolutions of 2010, I managed to complete one of them - and that was almost a matter of luck more than anything else! The rest were all partially completed. Now it's time for more resolutions for 2011. I have decided to be more realistic and set one genealogy goal. That's it. If I can stay on task and stay focused on one project at a time, I think I can complete the 2010 goals. Sounds easy doesn't it? Not for me. I know this will be the most difficult goal I've ever set. Perhaps even more difficult than a personal goal like losing weight or exercising more! I love genealogy. I love the research. I dislike compiling that research. I dislike entering the facts into my genealogy program. So it is easy for me to turn my attention to something more exciting or interesting and leave the first project in limbo. It may be that I have to establish a schedule for such things as working on my Peer books or scanning family photos or creating a Family Photo Album or.... whatever genealogical tasks I'm working on. That way I will know that on certain days at specific times I am working on Genealogy Project A, not Genealogy Project B. Wish me luck - I'm not very good at routines! I'm more of an impulse genealogist. If I feel like working on something, I do. But looking at the very long list of projects waiting for me to start or complete them I realize I'm in need of some structure. 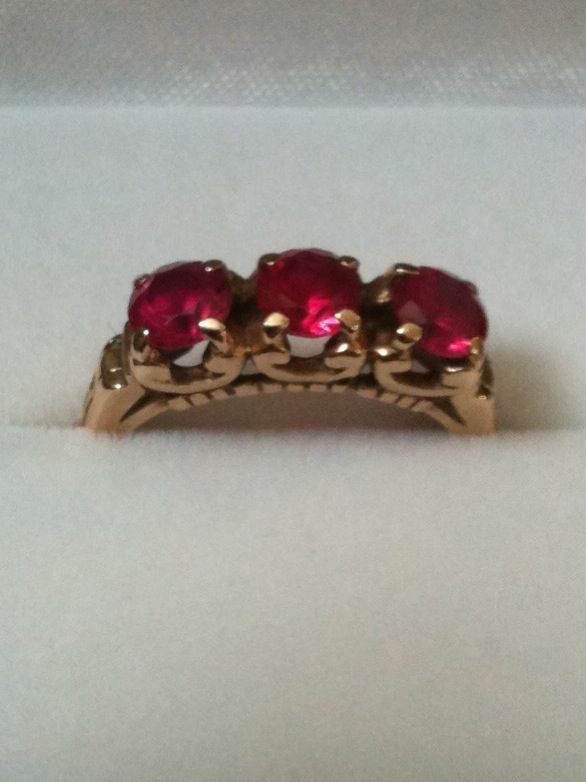 This was my Grandmother Ruth's Ruby ring. I've written before about my Grandmother before in posts "Happy Birthday Grandma Ruth", My Missing Grandmother and other stories. From the time I can remember Grandma told me it would be mine one day. When Grandma passed away in 1985 the ring went to my cousin and I was devastated. Grandma loved that ring and wore it every day. It personified her for me as she loved the colour red and even into her 80s she wore red pantsuits with a crisp white blouse. And topping it off - the ruby ring. I have not seen the ring in the past 25 years. My cousin went into a nursing home a few years ago and I wondered what happened to the ring. Well, this Christmas my 87 year old aunt (my cousin's mother) joined us for a family dinner. Much to my astonishment she took me aside and pulled out the Ruby ring, saying "This was always meant to be yours when Mother died" then handed the ring to me. The tears flowed freely as I slipped the ring on my finger. I am so grateful to my auntie and so happy to feel the strong connection to my Grandmother again. Did You Know.... about the NYGBR genealogical data? If you have ancestors from New York (formerly New Netherland), you may wish to consider joining the New York Genealogical and Biographical Society. Members have access to the complete set of the NYG&B Record. That's 140 years of articles and primary sources for New York families! There is other unique data online for members. For example Book One of the 1855 New YOrk State Census for Ward 17 of New York City is online and indexed in the E-Library. The rest will be added as completed. This is the only photo I have of my entire family at Christmas. It was taken in 1955. 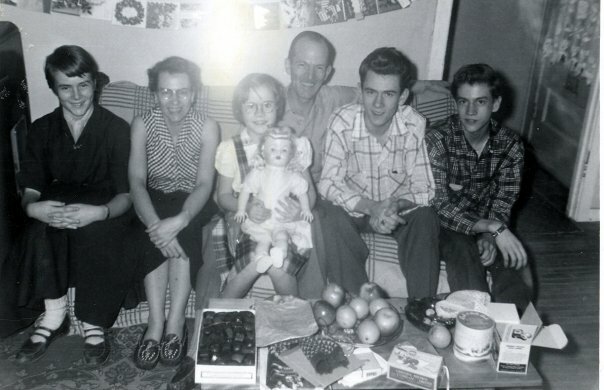 I'm the youngest one sitting on my dad's knee and holding a very precious gift - a walking doll. I was very close to my father and it came as a blow when he died at the age of 47 on Christmas Day 1960. I still remember the gift I bought him that year. I was in Grade 9 and had gone out on my own and purchased a little daschund china dog with cups hanging from its side. And there it sat, unopened, under the Christmas Tree while we waited for news from the Oshawa Hospital that Christmas Day. I was curled up in a chair in the corner of the living room while my mother and older siblings whispered in hushed tones in the kitchen. I remember our phone ringing many times. I remember the endless waiting while I stared at those unopened presents to my father lying under the tree. It was my brother who came to tell me that our father had died. The phone had rung and everyone was quiet. I heard nothing until my brother came into the living room and said "He's gone" It was difficult to feel anything except shock and bewilderment. I don't remember the rest of the day except at one point I sat in front of the tree and unwrapped the gift I had bought my father. I don't know what happened to that little dog with hanging cups. I'm glad I don't have it. I have enough sad memories at Christmas without a constant reminder the other 364 days of the year. I still miss my dad even though 50 years has passed. Christmas is a hard time for me. 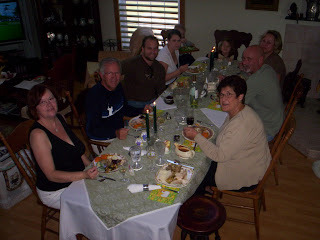 I love my family and love watching them open gifts, love having the big Christmas dinner(s) but late afternoon and early evening Christmas Day is a reflective and sad time in my heart. I'm always surprised by how much I still miss my father! So Dad - here's to you on this Christmas Day. You are not forgotten. My children and grand-children hear my stories about you and your life - as short as it was. Your photo hangs on my living room wall. And you are the reason I started searching our family tree. It was all for you. And genealogy led me to many marvellous things in my own life. Death took my father at far too young an age but I won't let him be forgotten. Don't Miss the Free BMD Postems! Mike of Genealogy Gazette mentioned a little known and under-used resource for genealogists on his Twitter feed. I checked it out and realized he's right - it's a gold mine for genealogists that is overlooked for the most part! Those of us with English ancestry no doubt know of Free BMD. This is the volunteer based website where you can search indexes to find the GRO reference for birth, marriage and death certificates. It's invaluable. I use it frequently. But I never realized there is a little feature called Postems. Postems allow visitors to add information to an index entry once found. So a genealogist could find an entry for an ancestor, send for the certificate and then enter some of the details on the Postem for that index entry. Mike pointed out that if more genealogists filled these out we could all benefit. Of course we have to avoid posting copyright material so I personally would not copy and submit the actual certificate word for word. But there's no reason a summary could not be submitted - for a birth registration you could simply submit the parents' names. "Charles Simpson married Sally Page. I have photos. Contact me at lorine@blah.com"
Now anyone looking for Charles will hopefully see that Postem and can contact me! Further exploration of the FreeBMD website revealed that visitors can search all Postems! So I searched for "SIMPSON" I was amazed to get 220 hits! These are all Postems, that is, user-added notes and details. I'm not about to slog through all 220 so I simply began adding more targeted keywords to find the Simpson entries I would be interested in. What a great resource. I hope all my readers with English ancestry will give it a try and start adding their own Postems. My New Year's Resolution is to add *ALL* of my English ancestors' certificate details to the FreeBMD Postems in the year 2011. Why not join me? I See a Dragon in My Future! Dragon Dictation is a free voice recognition application for the iPad (also for the Iphone or Ipod Touch). I'm using it to write this blog post. I'm not typing this, Dragon is typing it for me. How cool is that? It's very easy to use and within seconds of downloading it on to my Ipad I was dictating an email. I'm thinking about different genealogical uses for Dragon. I'm going to be attending the RootsTech conference in February (I'm an official Rootstech Blogger) and it seems to me that I can continue to write my daily blog posts using Dragon and that it will be much easier and faster for me then using my iPad keyboard. Dragon allows me to speak punctuation commands such as "period" or "new paragraph". This lets me format my writing exactly as I want it. That's the part I'm having trouble getting used to but I assume it gets easier the more you use Dragon. By dictating this blog post into Notes in Dragon I am able to pause and then resume where I left off. When I am finished my blog post I plan to correct any typos or errors and e-mail the post to myself. I could e-mail it directly to blogger to be automatically published on my Olive Tree Genealogy blog but this time I prefer to e-mail it to myself and copy and paste it into Blogger. I experimented with Dragon last night by sending tweets to my Twitter but it seemed a little strange to be speaking to my Ipad in front of my husband! And so this ends my first blog post typed entirely by Dragon as I spoke into the microphone on my IPad. I'm liking it and believe I can find many other uses for it in my Genealogy world. TORONTO, ON (December 15, 2010) – Ancestry.ca, Canada’s leading family history resource, has launched online two new collections of military records from the First and Second World Wars. Library and Archives Canada (LAC) carefully selected these records from their holdings, which provide rich detail about the experiences of soldiers in the two World Wars. These records were digitized as part of the Lest We Forget workshops – an initiative designed to connect students with the stories of Canadians who served and died in war. The collections, Selected Service Records of Soldiers, 1914-1918 and Selected Service Records of War Dead, 1939-1945, are fully searchable by the soldier’s name, birth and death date and keyword and provide unprecedented information about soldiers’ lives during their time serving in the military. Individual soldiers’ records in the collections contain up to three dozen forms detailing their enlistment, training, medical and dental history, hospitalization, discipline, pay, and discharge or notification of death, painting a rich picture of their lives and often tragic experiences. Selected Service Records of Soldiers, 1914-1918 contains a sampling of approximately 100 individuals who served in the First World War. Amongst these documents is personal correspondence from the few surviving complete service files which have been recently released by LAC. Selected Service Records of War Dead, 1939-1945 includes the enlistment records, medical and dental charts, evaluation reports, medal and promotion entitlements, letters (personal, military and recommendations), wills and inventory of personal effects of approximately 100 soldiers from the Second World War Service Files. These new records add to what is already the largest online collection of Canadian military records found anywhere in the world, one that includes the Soldiers of the First World War, a collection of attestation papers for nearly 600,000 Canadian soldiers who fought in the ‘War to End All Wars’. 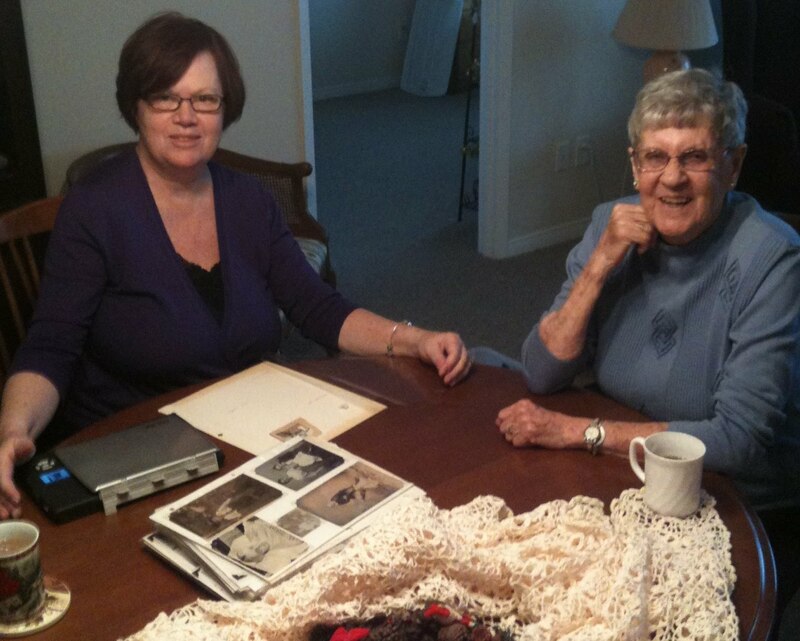 Ancestry.ca genealogist Lesley Anderson comments: “There are so many Canadians with ancestors who fought in the two world wars - many of whom made the ultimate sacrifice - and so it is important that new generations continue to learn about their stories through workshops such as Lest We Forget. Access to these collections, along with the other 128 million historical Canadian records available at Ancestry.ca, is part of the reason the company was recently short-listed by Canada’s History Society for the 2010 Pierre Berton Award, Canada’s top history prize, recognizing excellence in bringing Canada’s history to a wider popular audience. Landailyn - How Do I Love Thee? Landailyn Research & Restoration is my new rave. I have a new love! 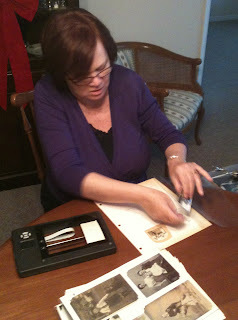 Janine Smith, the restorationist, is the magic behind Landailyn. I've read and heard a lot about Janine aka Landailyn over the past year and a few months ago I decided it was time to ask her to work her magic for me. As many of my readers know, I rescue old photographs - CDVs (Cartes de Visite) from the Civil War era. I have over 3,000 now and many are online at Lost Faces But I also have hundreds of family photographs that I have inherited as the semi-official Family Historian. Some of my family photos are in bad shape - faded, torn, stained - you name it, these family treasures have experienced it. I've been thinking about how great it would be to have some of these photos cleaned up and the faces made more visible. So I chose three photos and sent them to Janine for restoration. One photo was of my grandfather (who died before I was born) in England circa 1912. He's in a military camp with his buddies but the photo is so faded it's hard to distinguish his features. A second photo was of my great-grandmother with her three young children. It was taken in Ramsgate England circa 1889 and is faded as well as having inked-in eyes. My third photo was in very bad shape. 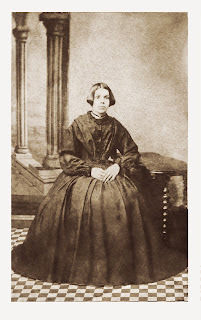 It is a CDV of my great-great grandmother Sarah Stead nee Elvery. It was taken in England in 1866, just one year before she died en route to Sydney Australia. Poor Sarah was only 32 when she died and I've longed to see her more clearly. In my photo her face is faded, the features barely discernable. 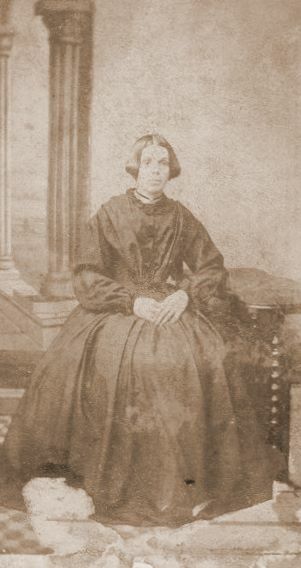 The photo is torn and badly marked. Parts of her dress are missing or stained. Only bits and pieces of the floor are visible. For a very reasonable fee, Janine took my three family photos and restored them. The restorations are beautiful! I am so impressed and pleased with the results! Wow. Isn't it amazing! I can now see my great grandmother's face. Look at how crisp and clear the folds of her dress are and how gorgeous the checkerboard square floor is. All three of my restoration projects turned out absolutely stunning. Janine's work is top-notch and I was pleased at how reasonable the cost was. She gave me a firm quote before work started - no estimates and then suprises at the end, I knew exactly what the project would cost. Janine has tutorials at TipSquirrel.com, in Shades Of The Departed digital magazine, and on Lynda.com. I've watched some of her video tutorials and they are extremely well done. Don't overlook Landailyn to put on your Wish List for a special day - your birthday, your Anniversary, Mother's Day, Father's Day... it would be a perfect Christmas Gift if you booked it ahead so Janine had enough time. So to answer my own question in the title of this blog post ... Landailyn How Do I Love Thee... all I can say is... in too many ways to count! To Scramble or Not To Scramble, That is the Question! Today is the last day for voting for the Family Tree Magazine Top 40 blogs. Many bloggers are scrambling to get their readers to Vote for them today. I've noticed that Olive Tree Genealogy is always nominated but never gets to the finals. Hey maybe it's because my blog isn't worthy but I wonder if it's because I don't scramble, I don't plead for votes (pleading my case makes me feel like I'm on Survivor and in the Final 3!) and I don't publicize the contests other than when they first come out. I would sound like a sore loser if I waited until after the votes are in to make another observation (especially if my blog isn't in the top 40) , so I'm making a comment now. I kind of think it's more of a popularity contest in many ways. Not in the sense of the BLOG being popular, but the person behind the blog. So if you're in the "in" group you have all the in-group voting for each other. Hmm... hope that doesn't sound like sour grapes, it's just an observation. But yes, I'd like to be in the final Top 40. So it's a Catch-22 situation! Should I scramble for votes or sit back and hope Olive Tree Genealogy is good enough and interesting enough to be voted for. On Survivor the person who doesn't scramble gets voted off the island! So here I am, asking you (aka scrambling) to vote for Olive Tree Genealogy blog in the Everything Section of Family Tree Magazine Top 40 blogs. It bothers me to ask. I'd rather you just went and voted for whatever blogs you like, and that you did it because you want to AND because you truly find the blog you are voting for useful and interesting! Anyway, please do vote - for your favourite blogs even if mine isn't one of them. I promise I won't throw a tantrum if I don't win a spot. A Sad Day for Genealogists with New Netherland (New York) Ancestors! After 15 years and 60 issues, New Netherland Connections is ending. Dorothy Koenig, editor and founder of this wonderful newsletter, is turning her attention to other genealogical projects. New Netherland Connections was a boon to those of us with ancestors who settled in New Netherland (present day New York). Scholarly yet readable articles by genealogists were the norm in this quarterly. Every issue brought new facts and discussions to our attention. I was privileged to have been a contributing author to New Netherland Connections in 1999 and 2001. Dorothy's expertise in the study of New Netherland was invaluable to my own writing. Kudos to Dorothy for her hard work and perserverance in publishing New Netherland Connections for the past 15 years. I wish to thank Dorothy for her efforts to aid in the continuing education and knowledge of New Netherland Settlers and history. I loved the first season of Who Do You Think You Are and am really looking forward to Season 2. NBC approached me some time ago requesting minor help with some Palatine research and information so I'm very curious as to which celebrity's ancestors were traced back to this exciting group of immigrants! UNIVERSAL CITY, Calif. – December 16, 2010 – Viewers can take an up-close and personal look inside the family history of some of today’s most beloved and iconic celebrities when NBC’s “Who Do You Think You Are?” returns for its second season on Friday, February 4 (8-9 p.m. ET). The celebrities who star in the series are Gwyneth Paltrow, Tim McGraw, Rosie O’Donnell, Steve Buscemi, Kim Cattrall, Lionel Richie, Vanessa Williams and Ashley Judd. From executive producers Lisa Kudrow (“Friends,” “The Comeback”) and Dan Bucatinsky (“Lipstick Jungle,” “The Comeback”) – through their production company Is or Isn’t Entertainment and Shed Media U.S. (“Supernanny,” “The Real Housewives of New York City”) -- “Who Do You Think You Are?” is an adaptation of the award-winning hit British television documentary series that leads celebrities on a journey of self-discovery as they unearth their family trees that reveal surprising, inspiring and even tragic stories that often are linked to crucial events in American history. From the trenches of the Civil War to the shores of the Caribbean, and from the valleys of Virginia to the island nations of Australia and Ireland, “Who Do You Think You Are?” will reveal the fabric of humanity through everyone’s place in history. Each week a different celebrity takes a journey into their family’s past, traveling all over the world. While giving viewers an in-depth look into their favorite stars’ family tree, each episode will expose surprising facts and life changing encounters that will unlock people’s emotions, show just how connected everyone is not only to the past, but to one another. 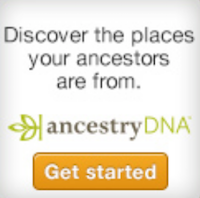 Ancestry.com is NBC and Shed’s official partner on the series and will help provide the research used to tell each story. “We’re thrilled with this year’s strong lineup and look forward to helping Americans go on their own journey of discovery alongside the stars,” said Josh Hanna, Head of Global Marketing for Ancestry.com . “Who Do You Think You Are?” is produced by Shed Media U.S. in association with Is or Isn’t Entertainment. Alex Graham, Lisa Kudrow, Dan Bucatinsky, Jennifer O'Connell and Al Edgington are the executive producers. The unique, award-winning series is based on the popular BBC television documentary series from Wall to Wall Productions, created and executive-produced by Graham. I'm an Official Blogger at RootsTech 2011! Exciting News! I was invited to become an official RootsTech 2011 Blogger and I've accepted. I'm so honoured and excited to be attending this 3 day conference in Salt Lake City as an official blogger. The first annual RootsTech Conference will be a gathering of both family history enthusiasts and technologists from around the world. Genealogy hobbyists and professionals alike will discover new and emerging technologies that will improve and simplify their activities. At the same time, technology providers will enjoy a rare, face‐to‐face opportunity to interact with family history enthusiasts to better understand their needs. As well as blogging about this event while I'm there, I'll be attending some of the dozens of wonderful workshops being offered. I'm especially thrilled to attend one of Thomas MacEntee's workshops "Genealogy Blogs: Impact and Influence in the Genealogy Community"
Not only is Thomas a newly discovered "cousin" through our Van Slyke ancestry, he's an innovator in the field of technology and genealogy combined, so meeting him in person has long been a wish of mine. There are many many workshops and exciting events to attend and I'll be sharing more about these over the next few months. Hope to see you there too! 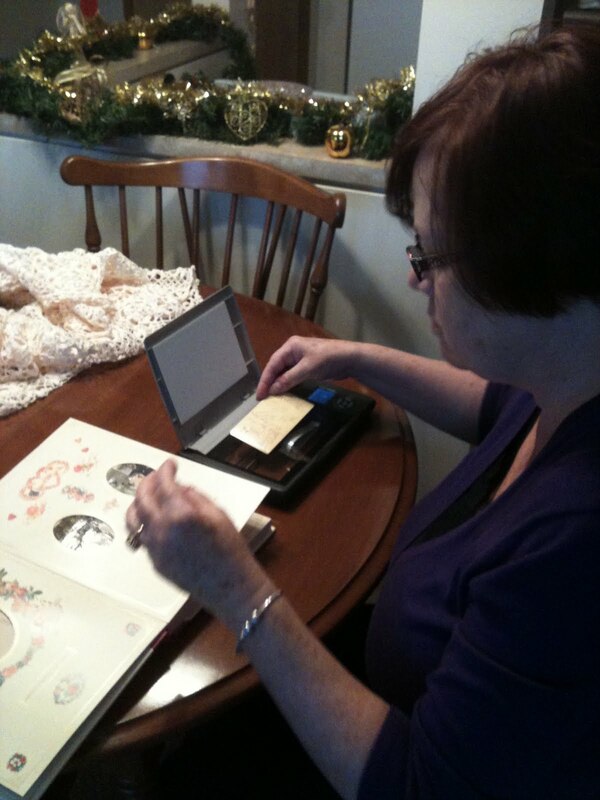 Do you have a genealogist or two you still need to buy for at Christmas? Or do you just want to present a Genealogy Wish List to your family members in hopes they buy you something special! 1. Flip-Pal Mobile Scanner. See my reviews on this amazing and powerful tool! 2. Gift subscription to an online genealogy site. There are many to choose from. My personal favourite is Ancestry.com . There are also GenealogyBank, Footnote.com and many many others. What genealogists would not love to have a year's access to one of these sites! 3. A genealogy book. If you know the recipient's family tree you could look for a book that has been written and published on one of their family lines. Or you could buy a more generic genealogy book such as The Everything Guide to Online Genealogy: A complete resource to using the Web to trace your family history (Everything Series) I like to check Amazon and Abe Books for such items. 4. Don't want to spend money but still want to give a thoughtful genealogy gift? Why not create your own book of photos or family stories or even a family tree? I really like how the Ancestry Family Trees can be self-published for free. You have a lot of control over how your book looks. Yes it's quite a bit of work, you will need time to do a really top-notch job but it's free! 5. Last but not least, consider a personalized mug or t-shirt or tote bag for your favourite genealogist. I have not done this myself so can't recommend a site, but perhaps readers will know of places they've used to create an item or two. I've given my husband my Christmas Wish List and I hope Santa brings me a few of the genealogy gifts I want this year. Yes, I'd love to receive a copy of Jacob Peer's marriage record so I can find out his wife's maiden name. Or the birth certificate of Joseph McGinnis so I can prove who his parents' were... but those are items I've searched for for many years. So they are on my Christmas DREAM List which really isn't likely to happen this year. But I can dream can't I? Olive Tree Genealogy Blog is thrilled to have been nominated for Family Tree Magazine's 40 Best Genealogy Blogs, or Family Tree 40. There are 117 nominations in 8 categories. I'm in good company as there are many excellent blogs listed there! If you like my blog, please vote for it (and tell your friends!). You can vote for 5 blogs in each of the categories. A reader on my Olive Genealogy Facebook Fan Page reminded me of the problems genealogists can encounter searching French ancestors who may have used dit names. 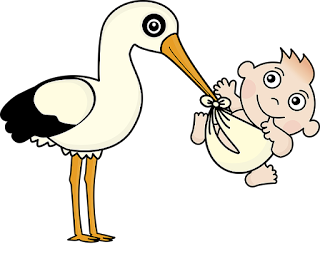 A dit name is an alias given to a family. A dit name doesn't just apply to one person, but to many members and generations of a family. The LeRoi/LeRoy surname underwent great changes, becoming LeRoy dit Audy or Ody, Audy and Ody in New France (Quebec), and Laraway (with variant spellings) or LeRoy in the United States and Canada. Some of Simeon's sons assumed the Audy dit name as a surname and there are Audy descendants today who are from Simeon LeRoi. Some descendants use the LeRoy surname. It's a challenge to trace backwards but researchers need to stick to it and keep those name variations in mind (dit names, accidental name changes, deliberate name changes, spelling variations, phonetic misinterpretations, etc. So keep searching and don't give up if you are faced with a challenging ancestor. Check to see if he may have been from New France at one time. Perhaps a dit name enters into your challenge. But I KNOW My Great Grandma's Name! So Why Am I Stuck? As I traced her lineage back, I found the trail stopped cold at *her* great grandfather, Isaac Vollick the Loyalist. 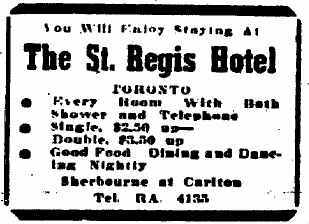 I could not find him in New York before he arrived in the Niagara area of Ontario with Butler's Rangers. I hunted in every resource I knew of, to no avail. There simply were NO Vollicks running around south of the border in pre-Revolutionary times! And then I stumbled on a very generous lady who steered me in the right direction with a casual remark "Oh did you know that your Loyalist ancestor Isaac Vollick used to be called Isaac Van Valkenburg?" Huh? How the heck did one go from being a Van Valkenburg to a Vollick??!!! But she was absolutely correct in her statement. The reason I could not find any Vollicks running around south of the border was because it was not a "real" surname! My Loyalist ancestor simply adopted it. I think he adopted it as a nickname "Valk" (Dutch for falcon) from Van Valkenburg (meaning town of the falcon in Dutch) which may be what his comrades in arms called him. And it stuck. It became an established surname and there are thousands and thousands of Vollick descendants running around in America and Canada today. There are also Follick descendants - because some of Isaac's sons and grandsons became known as Follick and that surname also stuck. I believe this alteration was due to the German/Dutch sounding "f" for "v". So instead of hearing Vollick, an English speaking/writing clerk no doubt heard Follick. And thus another surname was born! That experience taught me to open my eyes to the possibility that a surname as we know may have changed greatly over the centuries. It may have been changed deliberately as in the case of my Isaac Vollick, or it may have been changed through mis-communication or mis-hearing. For example my French LeRoy ancestor (prounced sort of like Le Wah in French - it's difficult to render it in text) settled in what is now Quebec in the mid 1600s. When he moved to New York, his name started being recorded as Larua, then Larraway. No doubt English speaking clerks mis-heard his name when he pronounced it! And so it began to be recorded as Larroway. You must have an open mind when researching ancestors. You don't know if they changed their names. It may have changed due to mis-recording based on language differences. Did they change it to escape a bad situation? Did they change it simply due to having an established nickname that took hold? Whatever the reasons, if you are truly stuck on an ancestor, think about possible name changes. You may need to develop an entirely new area of thinking and researching! Today we are featuring the Church Records. The first churches established in New York during the 17th century were Dutch Reformed, French Protestant, and Lutheran churches. As New Englanders migrated to New York, the Congregational Church (Puritans) and Society of Friends (Quakers) grew. Many New Yorkers joined both the Baptists and Presbyterians. By 1775 the Presbyterian Church was the largest denomination in New York. If your ancestors were in New Amsterdam (New York City) then these are a must in your genealogy research! Press Release: The Van Slyke Family in America: A Genealogy of Cornelise Antonissen Van Slyke, 1604-1676 and his Mohawk Wife Ots-Toch, including the story of Jacques Hertel, 1603-1651, Father of Ots-Toch and Interpreter to Samuel de Champlain REVISED EDITION by Lorine McGinnis Schulze. Published May 2010. Coil bound 8.5x11. While this book is not officially part of the New Netherland Settlers Series, Cornelis Van Slyke was an early New Netherland Settler. Cornelis Van Slyke's story is of a Dutchman who came to the New World as a carpenter at the age of 30, who became an interpreter for the Mohawk nation, was adopted into the tribe, and who met and married a French-Mohawk woman (Ots-Toch)who never left her native village. Their children, all raised at Canajoharie, one of the Mohawk castles or villages, became well-known and respected in the Dutch community. All except one left the village and married Dutch settlers. One of their children was Jacques Cornelissen Van Slyke who was known as Akes Gautsch, and whose Mohawk name was It-sy-cho-sa-quash-ka. Jacques was also an interpreter and one of the first settlers of Schenectady. My first book on the family was published in 1996. In the Revised Edition, new findings on the Van Slyke family in Breuckelen are revealed. New facts are added to the descendant genealogies and a few errors from the first book are corrected. More sources have been added and there is more detail about individuals included. There are 1,342 footnoted sources for the facts contained in this 287 page book. See the Cornelis Van Slyke book List of Contents and Download an Order Form to pay by check or pay using Paypal for this informative book. An order placed before Dec. 13th using Paypal ships the next day and should arrive before Christmas. What a great Christmas gift for a family member! This Press Release just in. The Seminar sounds very interesting. I am going to try to attend myself! Elizabeth Shown Mills, CG, CGL, FASG, FNGS, FUGA, has been described as "the person who has had the greatest impact on genealogy in the post-Roots era." We are pleased to welcome this prominent educator and popular speaker. She will conduct a day-long seminar on advanced genealogical techniques and research methodology for experienced genealogists and serious family historians. Date/Time: 2 April 2011 – 9 a.m. to 5 p.m.
Place: Auditorium, 2nd Floor, North York Central Library, 5120 Yonge St., Toronto. Cost: $45 public admission, $20 OCAPG members. Online beginning 15 January 2011. This year, my sister in law could not decorate for us so the job fell to me. I knew at the start that there was no way I could ever create a Christmas Tree as beautiful as the trees my sister in law decorates. Hers look like something out of Martha Stewart or Better Homes & Gardens! But I figured I'd give it a try and do my best. After several attempts to talk me out of having a tree this year, hubby gave up and moved the mess to get to the tree. Then began the complaints about how many trips up and down the basement stairs it was going to take to bring the tree sections up. I ignored the complaining and assigned Sunday as "The Day"! On that day hubby was expected to bring the tree up, put it together, put up the lights and move the couch so I could get all the tubs of ornaments out. I didn't think that was asking a lot. Apparently it was! Now, in fairness, I have a lot of ornaments. I like to change my colours or theme each year, so I have hundreds of ornaments in different colour schemes. I have dozens of plastic tubs full of these ornaments. But all hubby had to do was move the couch and pull the tubs out so I could get to the colours I wanted for this year (green and gold). All my tubs of Christmas ornaments are in one place - the cupboard I had put under the landing to our sunroom. It's about 4 ft by 8 ft by 3 ft high and is full. Full to the top with plastic tubs of ornaments and lights. Hubby pulls out the tubs. I ask him if he has everything out. Yep, he reassures me, there is nothing left in the cupboard. I think I saw him roll his eyes when I asked if that was everything. I start. I am an organized decorator. 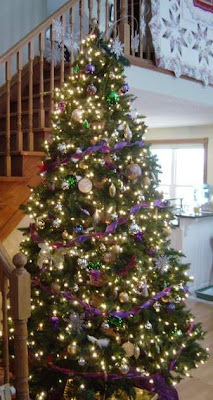 First on the tree are the ribbons (gold), then the strings of gold beads, then the largest green ornaments. I work my way down in size, only putting on green decorations until my entire tub of green items is empty. I stand back. I'm ready for the accent colours - gold decorations. Hmmm.... I can't find my tub of gold ornaments. Come to think of it where are my birds and dragonflies? I ask hubby if he has seen them. He shrugs his shoulders. I look at every tub again. Nope, no gold and no birds or dragonfiles. In fact, I seem to be missing what I call my neutrals - gold, silver and ivory ornaments. Where the heck are they? I am now pestering hubby repeatedly - are you sure you got all the tubs out? Are you sure you have not seen them? Hubby makes a huge mistake at this point, and suggests that perhaps I "tossed them into another tub" after last Christmas. He suggests I look through the contents of every single tub of ornaments because I probably just put them wherever I had room. I am aghast. Does he know who he's married to? Has he not seen my Christmas decoration organization each year when he and his sister get the ornaments out? I wrap every ornament in paper towels. I put matching sets either back in their orginal box or in a ziplock plastic bag. I label those "set of 6 hanging green" or "4 green pears" or "10 green balls, medium" You get the idea. Then I put all ornaments of one colour into a huge plastic tub which I also label (If you read my post I Love My Labeller you know I am obsessed with labelling things!) with a description such as "Green ornaments"
I also label by theme. I have one small plastic tub labelled "Winged creatures" This is the tub for my birds, dragonflies and anything else I have with - you guessed it - wings! So I end up with separate labelled tubs for each of: green, purple, red/burgundy, assorted colours, kids' favourites, must use, winged creatures, neutrals: gold, silver, ivory, ribbons for tree, bows.... yes I said I was obsessive about this organization. And every package inside every tub is also labelled. It saves me time! Thus my disbelief at hubby's suggestion that I nonchalantly tossed my gold and neutral ornaments into some other tub! I explained to hubby that I was missing a big tub labelled NEUTRALS, another smaller tub labelled WINGED CREATURES and a small tub labelled BOWS FOR TREE. He shrugged his shoulders and went back to watching tv. I asked for the third time if he had pulled all the tubs out from behind the couch. He furrowed his brow and said "I dunno, it was dark in there, maybe I left some at the back that I didn't see"
Sweat is now running from my own brow. I'm exhausted. I've hunted through tubs, in the basement, in our bedroom closet, under the stairs, and in the furnace room for those missing ornaments. I've asked several times if he got all the tubs and been reassured each time "YES" Now I am told "Well, maybe not..."
I bite my tongue. I swallow hard. As pleasantly as I can, I ask him to move the couch and look in the cupboard. I hear a sigh. It's not me. It's coming from hubby who complains that he has already moved the couch twice. I ask him to move it a third time. He says he will do it in the morning. Morning comes. I remind hubby about the couch. He sighs. He moves the couch with a great deal of complaining. He looks inside the landing cupboard. "Yea there's something way back there" he says. I wait. He looks at me. I continue waiting. He continues looking at me. Finally I say "I'd like to have those tubs" He responds "I can't reach them" I wait. Nothing happens. I repeat "I'd like to have those tubs" He looks at me and says "How do you expect me to get them?" I fight the urge to scream. "How about crawling in on your belly and reaching them" I suggest. He isn't pleased at my suggestion but he does as I ask, grumbling the entire time. "I'm getting dirty" he says. "There's dust in here" "My sweater is getting covered in sawdust from the reno" I hear cursing and thumping. The dogs run and hide. Hubby is clearly not happy so that makes two of us. Four if we count the dogs. Finally he pushes out the tubs and rather dramatically begins brushing at his pants and sweater. I listen to more grumbling about how hard he has been working to get this "*#$$%%@@ tree decorated" (his words, not mine). And there indeed were my missing tubs. I finish the tree and then for the final touch - the gold bows. But they are nowhere to be found! I hunt through every tub even though I know they are in their own small one - clearly labelled BOWS FOR THE TREE. Dare I ask hubby if he has seen them? I casually mention that I seem to be missing my big gold bows and I need them to finish the tree. He shrugs his shoulders. "Haven't seen 'em" he says "Maybe you tossed them in to another tub last Christmas" ARRGHHH!! As hard as it might be to believe - no husbands were harmed in the decorating of the Christmas Tree at our house. It's Movie Monday one day late! I couldn't upload my Cemetery Walk movie to Olive Tree Genealogy YouTube Channel yesterday but here it is today. So get out your popcorn, put your feet up and enjoy! There are 30 photos in this video with more to come. Be sure to also check out AncestorsAtRest.com for more photos of Cemeteries in America and Canada. Today was scheduled to be Week One of our second round of 52 Weeks of Sharing Memories. 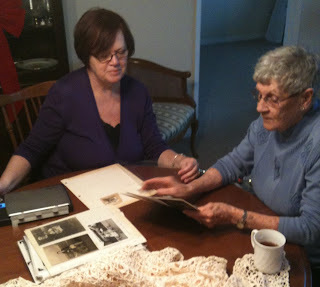 Sharing Memories is a way of writing a Genealogy Journal - our own! Genealogists are often so busy tracking down detail on an ancestor's life, that we forget how important our own life and memories will be to descendants in the future. Last year I started a weekly topic to help us write our Genealogy Journals and share those memories for the future. We finished our 52 weeks and I turned my Genealogy Journal into a book which I'm giving to my children this Christmas. I have decided that I won't begin my next set of topics for Sharing Memories. until the New Year and that will be Sunday January 2, 2011. But for the rest of Decemember I invite you to follow along with Thomas MacEntee's Advent Calendar of Christmas Memories. It's a great way to continue writing when you have time in this busy season. I started wrapping gifts and decorating the tree today, and that brought back lots of memories of the wonderful skinny little Santas that we used to hang on our tree. I wish I had them now! 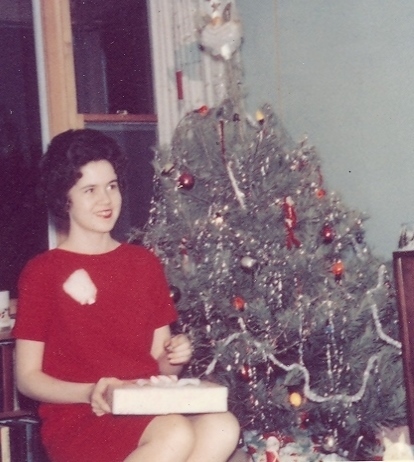 That's me in front of the tree at our family home in the early '60s. You can see one of the skinny Santas hanging. Sadly I have none of our family ornaments but I did love decorating the tree every year. Library and Archives Canada holds a small collection of church records of baptisms, marriages and burials, some of which are indexed by name. To provide better access to those indexes, the information they contain has been entered in a database that will expand slowly over the next few years. 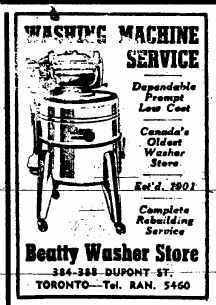 This is a brand new Canadian genealogy database from Library & Archives Canada. In 1789, what is now the Province of Ontario was part of Quebec. It was divided into four districts: Hesse, Luneburg, Mecklenburg and Nassau. The Land Boards were created in 1789 to oversee land matters and facilitate settlement in the four districts. This research tool includes more than 16,400 references to the Upper Canada Land Board records. The following update was received from FamilySearch. It looks exciting, lots of new data coming online quickly now. Have you volunteered to help index? FamilySearch volunteers have some exciting new indexing projects to work on during this holiday season. Recently released projects include records from Canada, Mexico, Ireland, Jamaica, Nicaragua, and the United States. There are also projects from four different countries that were recently completed and will soon be available for searching at beta.familysearch.org. Readers may recall that in May I posted a request for help in finding a descendant of an Illinois soldier who went MIA and was later found to have been killed during the Vietnam War. The soldier's name was Charles Peter Claxton and Debbie had a copper bracelet with his name engraved. She wanted to send the bracelet to a descendant. Readers jumped in to find Charles. Within a few days we had quite a bit of information (see the comments on the original post) but no contact with a descendant. Well, I'm pleased to say that yesterday his daughter Kimberly wrote to me! Hello, my name is Kimberly (Claxton) Samuelson and this is my father. My mom, sister and brothers are all currently living in Michigan. My dad was originally from Illinois and was career Air Force. Thank you all so much for caring about my dad and family. Now I can put Kimberly in touch with Debbie and the bracelet can be given to Charles' daughter. Hopefully it will bring some joy to the Claxton family. We've had great success with our Lost and Found requests thanks to the generous help of Olive Tree Genealogy blog readers. But we still have a few missing. Please take a moment to read the stories and perhaps have a look to see if you can help bring a Lost and Found item back to a soldier's family.